Eldridge Plays and Musicals. Are We Scared Yet? Max and Katie are lost at a spooky campsite in the middle of the woods. Fortunately, Counselor Ned, a cheerful, but rather strange, camp counselor is there to help them out until the other campers and counselors find them. To pass the time, Counselor Ned suggests they all take turns telling scary stories, a "campfire tradition as old as time." As they take turns telling their tales, the stories come to life onstage! The story of "Taily-Po," an American folklore classic, reveals an old man living in the woods with his sarcastic dog… "The Backseat Driver" gives a new twist on a popular urban legend… and "A Girl and Her Dolly" becomes a cautionary tale of a possessive and very creepy doll. After each story, Max and Katie wonder when the other counselors will show up and lead them back to the cabins, while Counselor Ned becomes more and more mysterious. What could he be hiding? Are Max and Katie in the middle of their very own ghost story? 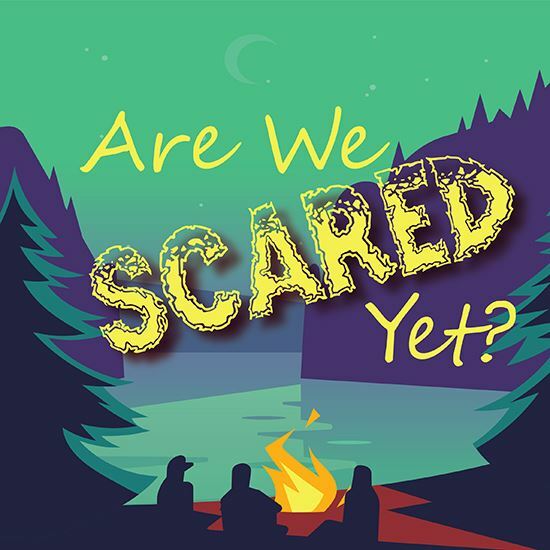 "Are We Scared Yet?” is an easy-to-produce scare fest for any theater group, and delivers a ton of laughs... and maybe even a few goosebumps! A: I have the good fortune to write a play every summer for my hometown theater, the Center Theatre, which holds a summer camp for children. This year, I kept thinking how fun it would be to write a play about campfire stories--- I knew it would be able to include a good number of kids, or, if need be, kids could be doubled. I used to love books of scary stories when I was a kid. Writing this play brought back a good number of fun memories. A: I really enjoy the characters of Rufus, Jason Kreuger, and Whimsical Wendy, but I think perhaps my absolute favorite part is when Cassandra enters in the “Taily-Po” scene to drop off her son, Justin. She is such a funny, assertive character, concerned pretty much with her own needs. I like how she talks to her father and to her son. A: Some were based on old urban legends, some on an old folk tale, and some based on me (but I won't say which ones)! A: I wanted to write a play with a lot of laughs and a chance for a few goosebumps. I also wanted a play that was fun for the young people involved in the production. According to my campers from the original production, I succeeded! Whew! A: I tried to make this play as easy to produce as possible, with opportunities for many students, or few students with doubled roles. Staging can be simple or complex, depending on resources. I encourage directors and actors to have fun with the show... if you have fun, so will your audience! I also want to give a big thank you to the Center Theatre, and my original cast of kiddos!